Peanut Butter Cookies are a special treat in our house. 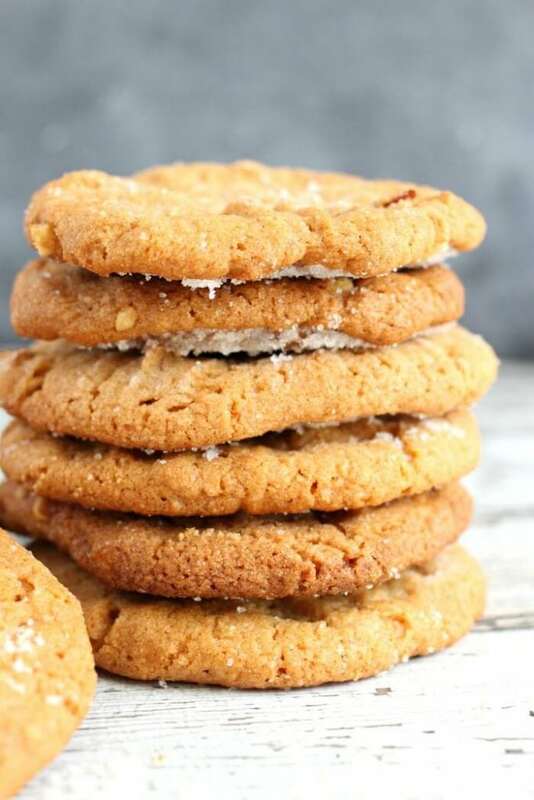 This peanut butter cookie recipe only uses three ingredients that you definitely already have in your pantry! 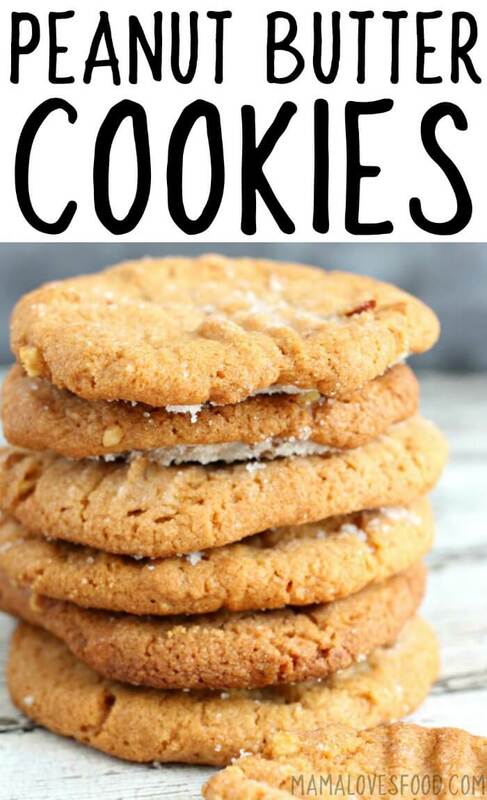 If you love peanut butter cookies, then you’re in for a real treat. 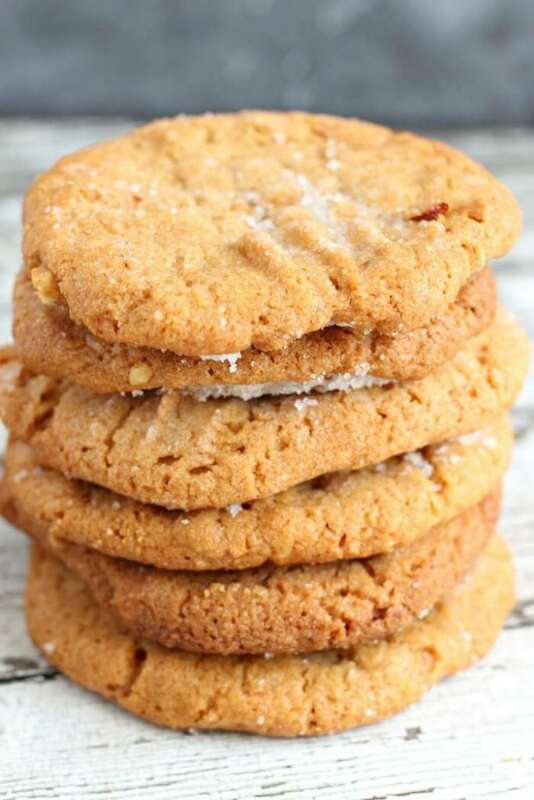 Our peanut butter cookie recipe is three ingredients that most folks keep on hand all the time. We like to eat these easy peanut butter cookies on a Friday movie night after a yummy cobb salad and homemade pizza. 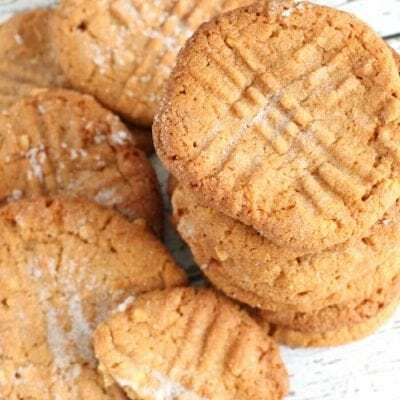 Peanut butter – I (strongly) prefer chunky peanut butter for our cookies, but both smooth and chunky will work in this peanut butter cookie recipe. Sugar – Regular white sugar is all you’ll need. Nothing fancy, just delicious! Egg – The egg will work as a binding agent and also give it some rise. Peanut butter cookies tend to be dense. By making the fork marks and flattening the cookies in the middle, it allows them to cook more evenly. Also, it’s a great place for that extra sprinkle of sugar to collect. How do you know if peanut butter cookies are done? You can tell that peanut butter cookies are done when the tops are lightly brown and the cookies have spread out a bit and puffed up. Don’t wait for the cookies to harden in the oven, they will do that as they cool. 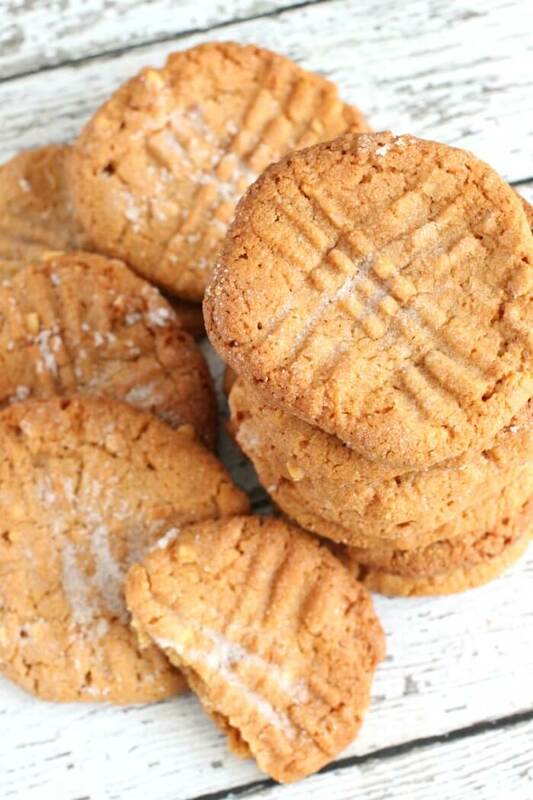 When was the first peanut butter cookie made? 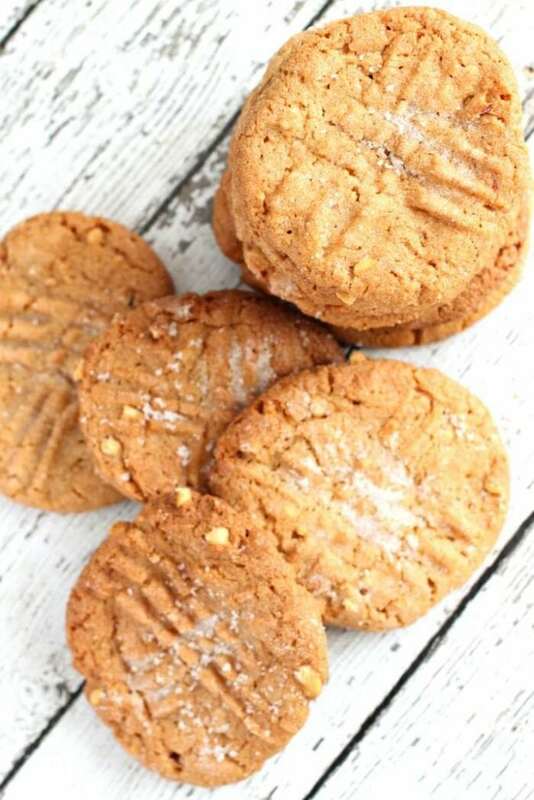 The Aztecs invented peanut butter in the 14th century, but peanut butter cookies didn’t become an American favorite until the early 1900s. Are peanut butter cookies supposed to be soft out of the oven? 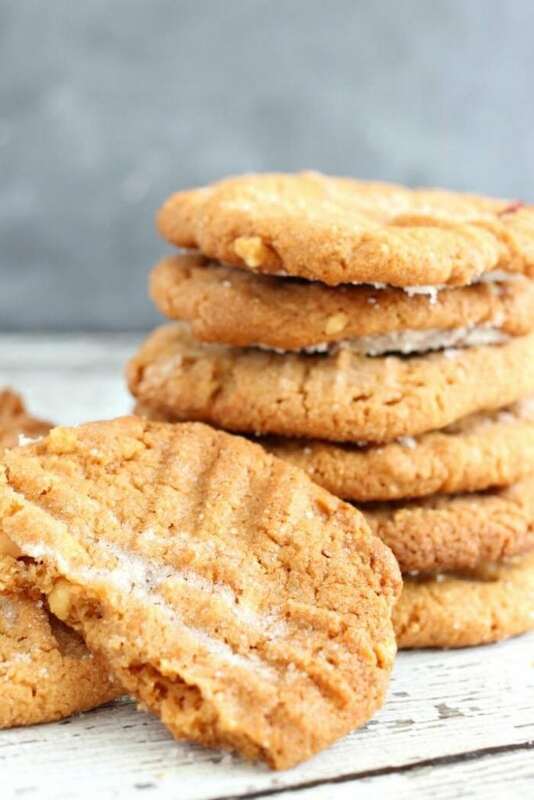 Peanut butter cookies should be soft when they are removed from the oven. They will harden up some as they cool. If you wait until the cookies are hard before removing them from the oven, they will be too hard to enjoy when cooled. Remember that the smaller you make your cookies, the shorter the cook time will be. Are peanut butter cookies gluten free? 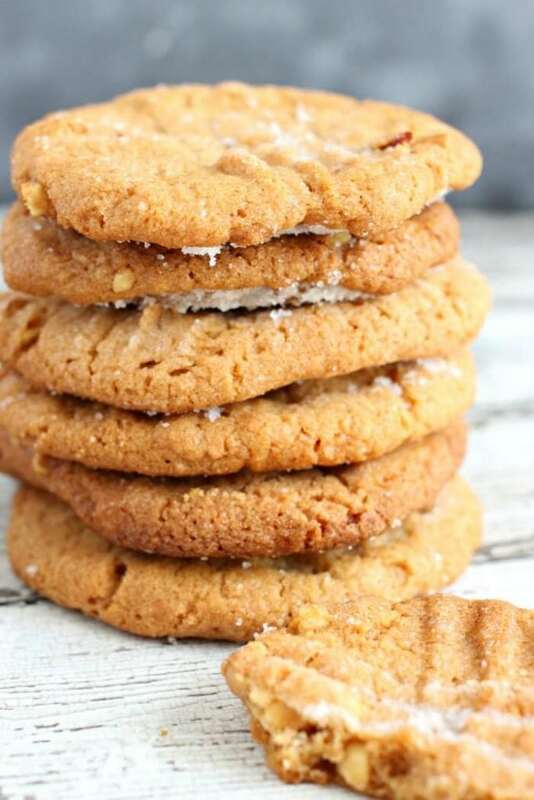 This recipe for peanut butter cookies is gluten free. They are are completely flourless and made with only three simple ingredients: peanut butter, sugar, and eggs. You can use regular or crunchy peanut butter to make them (I’m partial to crunchy!). Mix ingredients thoroughly until a dough has formed. Print criss-crosses with a fork (I dipped my fork in flour to keep stickage at a minimum). Bake 10-12 minutes at 375 degrees and then sprinkle with sugar as soon as you take them out of the oven (so it sticks!). Ooo. Look at that photo! Stop flirting with me sugar. I see you glistening over there. NO. I WILL NOT MAKE COOKIES. Sorry April! Trying to kick my sugar habit. If anything could knock me off the wagon, this post would girl! These look so good! I am amazed at your picture taking abilities as well! LOL! Hey thanks for stopping by and leaving such a nice comment and following my blog. 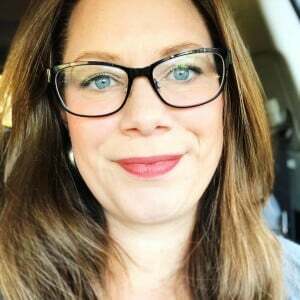 I'm excited to follow you back! I have been LOVING peanut butter cookies lately! These are so good!! Perfect for a sweet treat. Giiiiirl, you had me with that sparkly sugar! Thanks for motivating me to bake today!!! I dip my fork into sugar 🖤. I need to grab said sugar and make these! Best peanut butter cookies ever! My family loved these cookies! Thanks for the great recipe! Easiest cookies ever! Love it! These cookies are so irresistible! I could eat the entire batch!